At least 105 persons were killed and 133 wounded in a car bombing today outside a medical centre in Hilla, south of Baghdad, the deadliest attack in Iraq in a year, medical officials said. “Our definitive toll after taking away the last victims is 105 dead and 122 wounded,” said Dr Mohammed Dia, head of Hilla’s General Hospital. 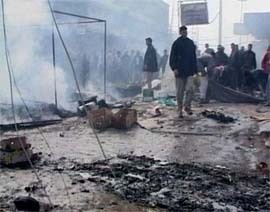 The car bomb blew up in a crowd of civil servants gathered outside the medical centre in a packed commercial district. A video image shows Iraqis standing in debris and rising smoke on Monday following a suicide car bomb attack on a crowd of people in the town of Hilla, south of Baghdad, which killed 110 persons and wounded 130. Farooq Amjad Mir of the ruling PML won the Lahore NA-127 seat by a margin of 6,890 votes in by-elections held here on Sunday, according to unofficial results. According to the unofficial results announced at around 11.45 pm, Farooq Amjad Mir polled 29,268 votes against 22,378 of the ARD. Awami Qiadat Party’s candidate, Noor Naeem Khan, got 126 votes. Pakistan today expressed concern over the 7.8 per cent hike proposed by India in its Defence Budget, saying it could trigger an ''arms race'' in the region. What we need to discuss is restraint and a balance in conventional weapons, Foreign Ministry spokesman Masood Khan said at a press briefing in Islamabad. Armed only with a song, two naturalists flushed what may be the world’s rarest bird on the steep slopes of the Himalayas, a species never before seen alive in the wild. Million Dollar Baby, a gut-wrenching boxing drama that entered the Oscar race at the last minute, scored a knockout victory at the academy awards, winning four awards, including best film and director for Hollywood legend Clint Eastwood. 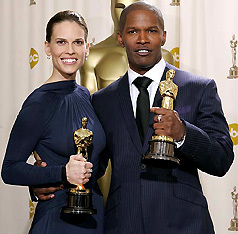 The movie was nominated in seven categories and earned the best actress Oscar for Hilary Swank. At least 105 persons were killed and 133 wounded in a car bombing today outside a medical centre in Hilla, south of Baghdad, the deadliest attack in Iraq in a year, medical officials said. “Our definitive toll after taking away the last victims is 105 dead and 122 wounded,” said Dr Mohammed Dia, head of Hilla’s General Hospital. The car bomb blew up in a crowd of civil servants gathered outside the medical centre in a packed commercial district. Civil servants had gathered there for physical exams that would permit them to go to work for the state or return to jobs lost with the fall of Iraqi President Saddam Hussein’s regime in April 2003. Ambulances rushed the dead and wounded to the hospital as the wreckage of the explosives-packed car smoldered in the street. Local shopkeepers helped lift the dead and wounded from the debris. The car was packed with several dozen kilos of TNT and mortar shells to cause “the maximum number of victims”, said police forensics chief Thamer Sultan. “This criminal act targeted citizens who did not have any ties to the army and the police and who had chosen to live in peace,” said Governor of Babil. The ARD leadership, however, refused to accept the result, saying it was the ‘worst post-poll rigging’ and decided to lodge its protest in Monday’s session of the National Assembly. The voting was held in a peaceful manner, with the ARD levelling allegations of excessive use of official transport — a charge denied by Farooq Amjad. There were conflicting reports about the turnout of voters and even newsmen’s assessments were based on the polling in the areas they were covering. It was heavy in some areas but below normal in others. However, most of them agreed that it was between 20 and 40 per cent. No official figures were available till the filing of this report about how many of the 237,065 voters had actually gone to 216 polling stations to cast their votes. Even the ruling party candidate refused to comment on the percentage of votes cast. “It was certainly better if compared with other by-elections, but it would be too early to say anything about turnover in numerical terms,” he said while talking to Dawn in the evening. Mian Nawaz Sharif, former prime minister and leader of his own faction of Pakistan Muslim League, termed the victory of the ruling PML candidate as yet another case of denial of popular verdict. Pakistan today expressed concern over the 7.8 per cent hike proposed by India in its Defence Budget, saying it could trigger an ''arms race'' in the region. What we need to discuss is restraint and a balance in conventional weapons, Foreign Ministry spokesman Masood Khan said at a press briefing in Islamabad. The increase in defence budgets would not be a "helpful trend" and an atmosphere of arms race is needed to be avoided, he added. Mr Khan said during bilateral talks with India on confidence building measures (CBM's) on nuclear and conventional weaponary, Pakistan had raised the issue and underscored the need to discourage any arms race in the region. Armed only with a song, two naturalists flushed what may be the world’s rarest bird on the steep slopes of the Himalayas, a species never before seen alive in the wild. The sighting of the secretive stub-tailed creature, known formally as the rusty-throated wren-babbler, was disclosed on Saturday by the American Museum of Natural History in New York. The sighting was confirmed with photographs and videotape. Benjamin King, a museum ornithologist, and Julian Donahue, a retired curator at the Los Angeles Museum of Natural History, identified the bird during a November expedition into the Mishmi Hills of northeastern India near the Chinese border, at an altitude of about 8,000 feet. They lured it into the open by playing a tape recording of bird calls, Donahue said. “It was flying low along the ground and behind bushes and in the brush. We could hear it, and we could see glimpses of it, and it flew from one spot to another. It took an hour of chasing this very elusive secretive bird before we could see enough to convince ourselves,” Donahue said. The only previous evidence of the species had been a single dead bird found in 1947 during an expedition into the region led by S. Dillon Ripley, head of the Smithsonian Institution. Westerners are rarely allowed into this densely forested part of India. Ross Kauffman (left) and Zana Briski won the Academy Award for best documentary feature for the film Born Into Brothels. 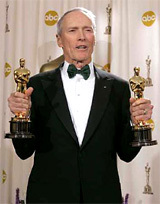 Million Dollar Baby, a gut-wrenching boxing drama that entered the Oscar race at the last minute, scored a knockout victory at the academy awards, winning four awards, including best film and director for Hollywood legend Clint Eastwood. 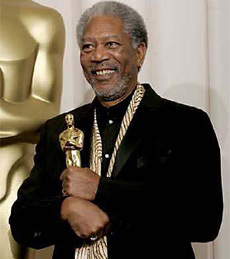 The movie was nominated in seven categories and earned the best actress Oscar for Hilary Swank last night, playing a boxer who longs to be a champion, and the best supporting actor award for Morgan Freeman as the aging gym manager who persuades his boss, a trainer portrayed by Eastwood, to take on the young fighter. The movie bested chief rival The Aviator, an epic tale of the eccentric life of billionaire Howard Hughes in the show’s top categories, including Eastwood’s victory over Martin Scorsese in the best director group. Had Scorsese won, it would have been the first ever Oscar victory for the director of such American classics as Raging Bull, Taxi Driver and Mean Streets. The Aviator could manage only one top award for best supporting actress for Australia’s Cate Blanchett. It took home four others for film editing, cinematography, costume design and art direction. In the other major acting award, Jamie Foxx as soul singing legend Ray Charles in Ray was named best actor. It is only the second time in 77 years that the Academy of Motion Picture Arts and Sciences has given the Oscars to two black Americans in the same year in top acting categories. Halle Berry won for best actress and Denzel Washington won for best actor in 2002. Million Dollar Baby was originally slated to open next year but at the last minute Warner Bros. decided to release it in time to qualify for Oscars. The movie took only 37 days to make and was based on the original draft of the screenplay. Beirut: Thousands of demonstrators shouting “Syria Out!” rallied in downtown Beirut after Opposition movements vowed to defy a ban on public demonstrations. Youngsters carrying the Lebanese flag were converging on Martyrs’ Square, where the opposition has called for a peaceful sit-in on Monday in defiance of the ban.